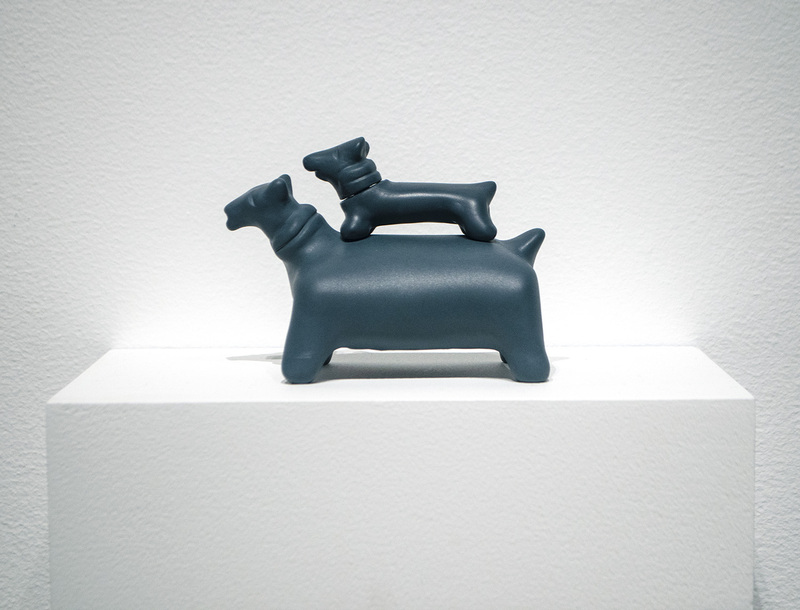 The MexiCali Biennial, now presenting its fourth edition, is a bi-national initiative curated by Ed Gomez, Luis G. Hernández, Daniela Lieja Quintanar, and April Lillard-Gómez taking place in venues on both sides of the California-Mexican border throughout this year. The biennial opened earlier this summer with a two-day series of performances at LACE in Los Angeles. 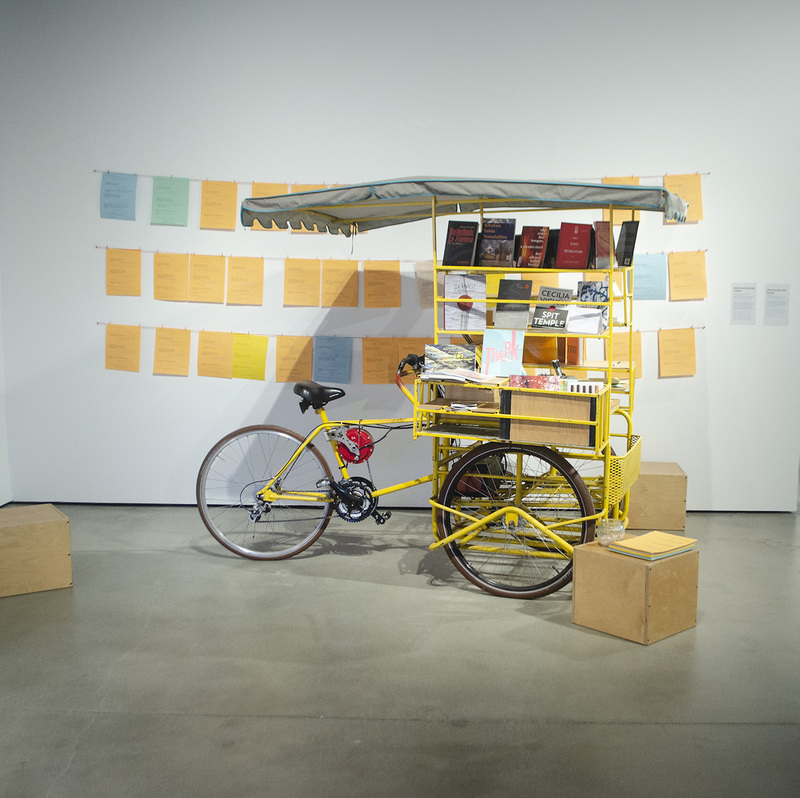 The second iteration, CALAFIA: Manifesting the Terrestrial Paradise, takes the biennial to the campus of California State University in San Bernadino with a group show at the Robert and Frances Fullerton Museum of Art. 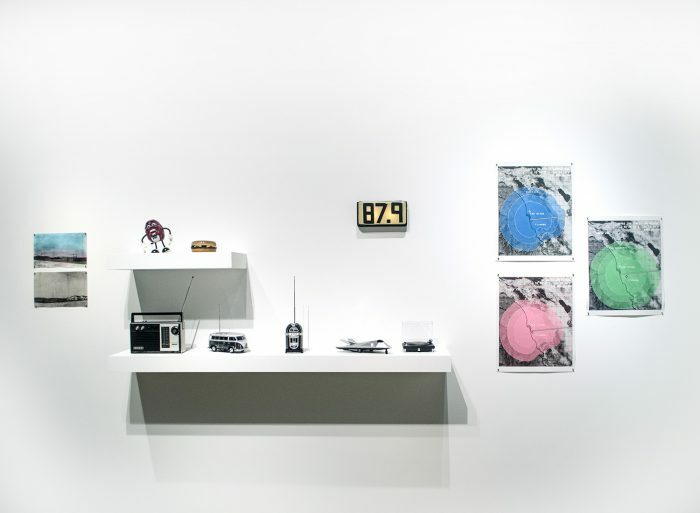 The peripatetic and sprawling format of the MexiCali biennial works to critique and destabilize defined centers, peripheries, and borders that have defined the history and culture of the region. 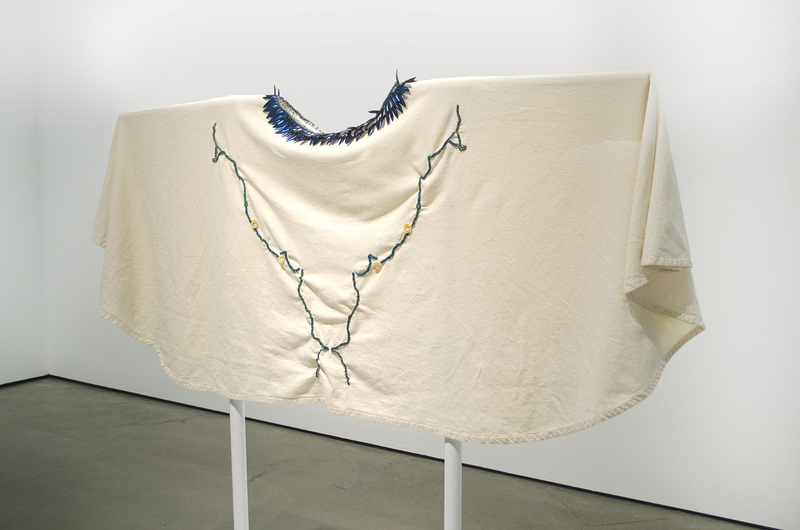 Featuring 30 artists working in and around the border region, CALAFIA, takes its cue from a work of fiction by the Spanish writer, Garci Rodriguez de Montalvo, which is believed to be the source for the state’s namesake. His novel, Las Sergas de Esplandián (The Adventures of Esplandián), first printed in 1510,features a character named Calafia described as a Black warrior queen who presided over a mythical island called “California,” which was resplendent with gold and inhabited by womenwarriors and fantastical creatures, such as the Griffin. 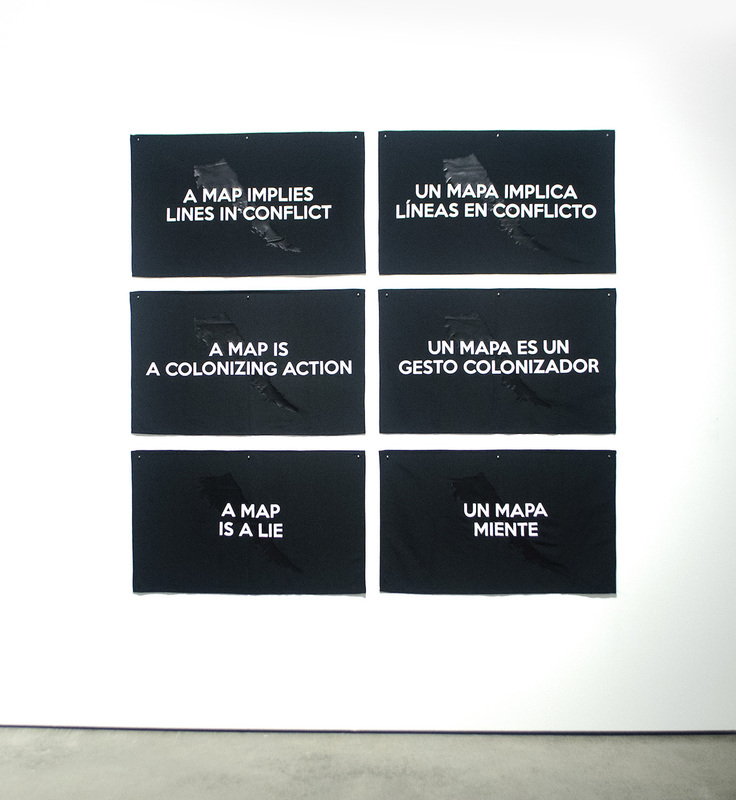 This imaginary territory proves to be a fruitful organizing concept for the show as it presents California as both a paradise and a battleground and invites us to envision what California might look like today if brown bodies, their histories, and cultures were not continuously displaced, disconnected, and disappeared from lands they originally inhabited. 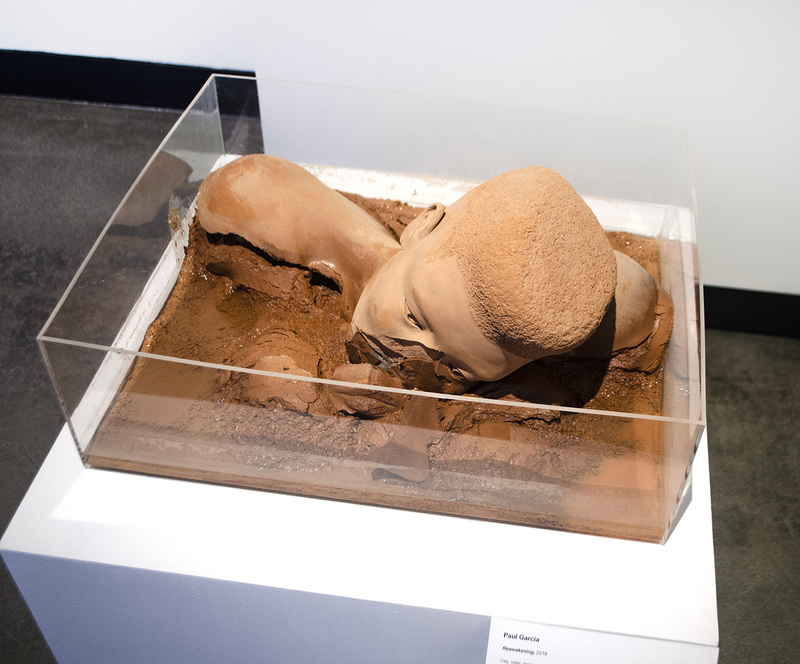 Calafia, a figure produced by colonial fantasy, is reinvisioned by artists in the biennial as a powerful source of subversion and resistance against the colonial imagination, both past and future. 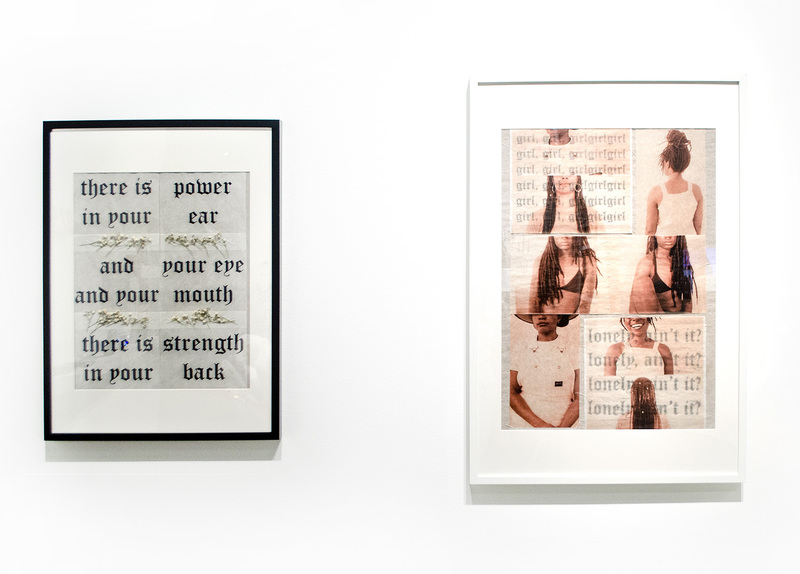 Many, but not all, of the works in the show directly address the myth of Calafia and turn to her as a symbol of female power. 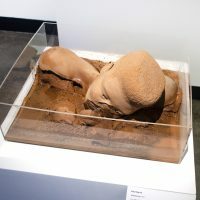 One example is Maya Mackrandilal’s rendition of a portrait bust of her figure in the mixed-media sculpture, ANTI- body 9 (Kalafia as Libertas). 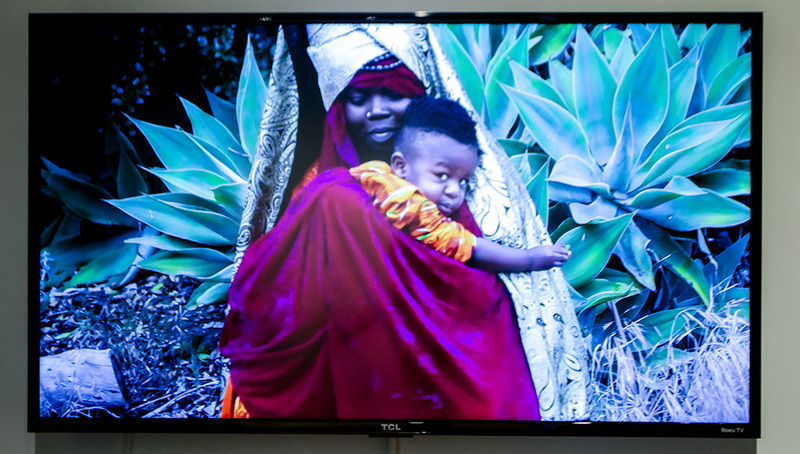 This is also the case for one of the most compelling works found in the show by the artists of SNATCHPOWER, a self-described “PostApocalyptic, Afrofuturistic, Womens Liberationist, Artist Collective.”Channeling Calafia (Canalizando a Calafia), 2018, which also premiered at LACE this summer is an acid-tinged, is a futuristic rap video that features members of the collective take on the identities of the warrior queens of California to imagine a future where women have reclaimed the spaces—in this case, the natural environment—that have been stolen, colonized, and co-opted across time. 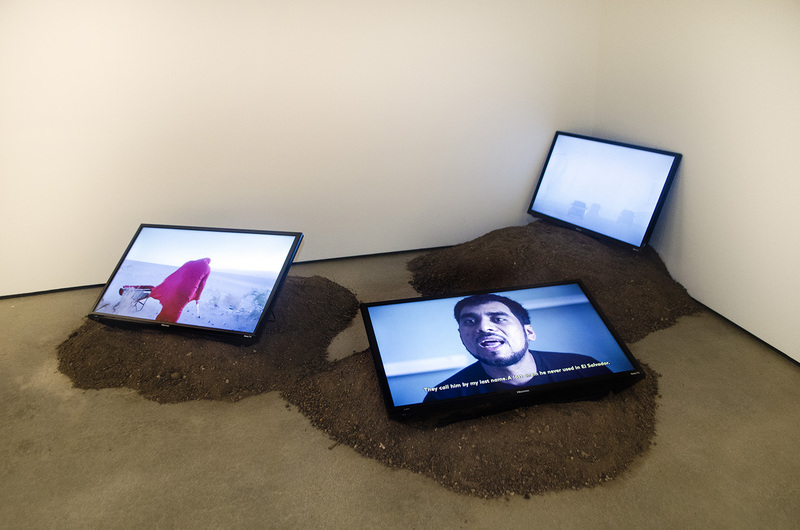 A nearly dystopian imagining of California’s mythical roots is found later in the show, in Victoria Delgadillo and Raul Baltazar’s 2018 video Califas, a hallucinatory film that while visually compelling could have benefited from more explanation or context. In such examples, Calafia is a symbol of implausible utopia with powers to restore and renew but also to dominate the natural landscape. 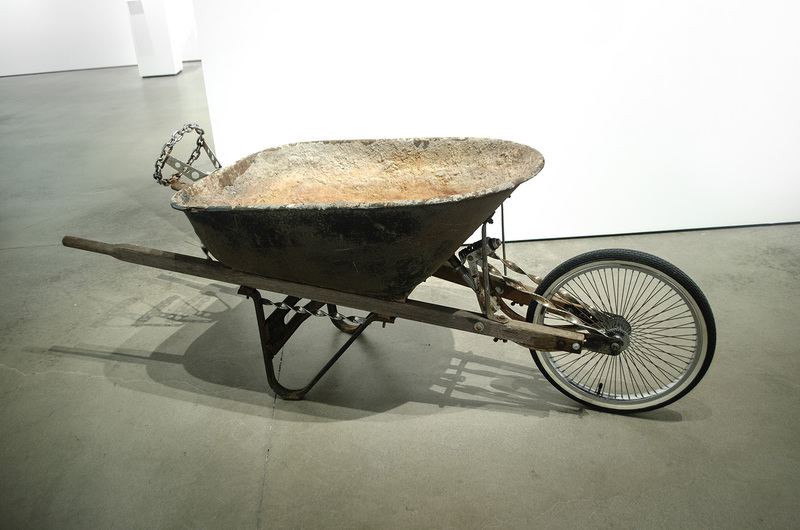 Other artists refer to Calafia by less direct means but are nonetheless expressive of this curatorial vision. 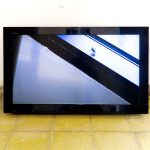 Xandra Ibarra’s La Corrida – The Run (2012) a video installation featured near the beginning of the show features a female figure, presumably the artist, running through border zones in the Chihuahuan Dessert. The trick is that the video is only activated once a viewer mounts the antiquated treadmill that is installed in front of the video and begins to run. 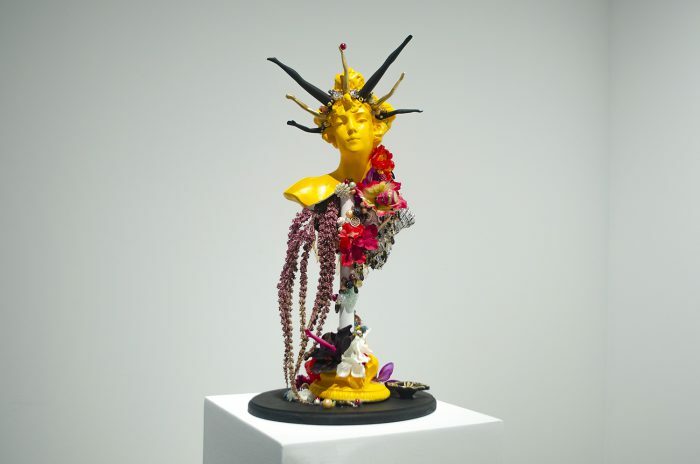 While is unclear if the artist was thinking about Calafia and her female warriors, one can easily imagine the artist among her ranks or even inhabiting the role of the Queen. It is notable that this work requires effort. As I chugged along, attempting to force the treadmill to begrudgingly move beneath my feet, it was also impossible not to consider the millions of immigrants that have made a run for their lives across this stretch of desert. While I was at first skeptical of this set-up, days later I can still recall the sensation of walking into the remainder of the biennial with my heart beating hard and fast. 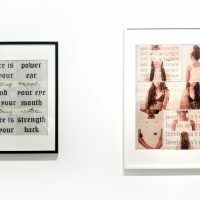 Another strength of the biennial, aside from including a great number of female artists, was the curators’ desire to address external and internal perceptions between communities of color in California. One work that treated these concerns adeptly is Chris Christion’s video, The Unauthorized Historiography of California, Volume 1 (La historiografía no autorizada de California, volumen 1), 2018, which re-examines historical events, like the Los Angeles riots in 1992, that have both divided and united minority communities. 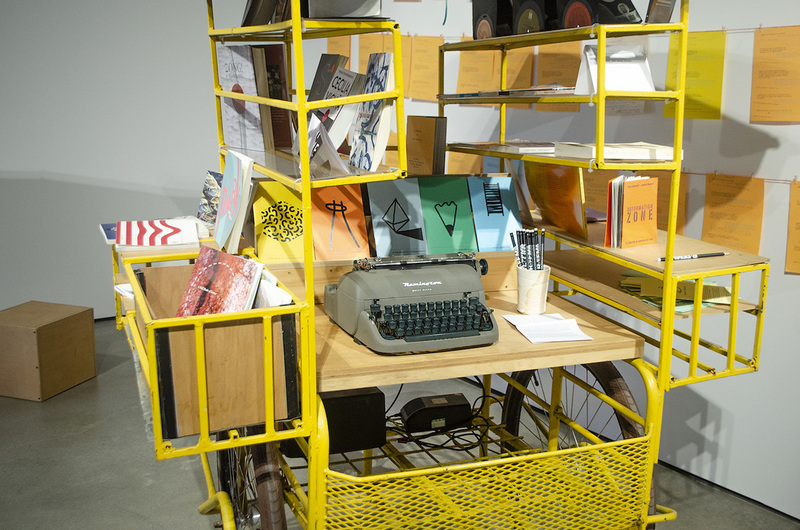 Cognate Collective’s installation, California Mía, installed nearby, refences transborder communications through an almost archival installation of FM radios and archival materials in their study on “border blaster” radio stations. 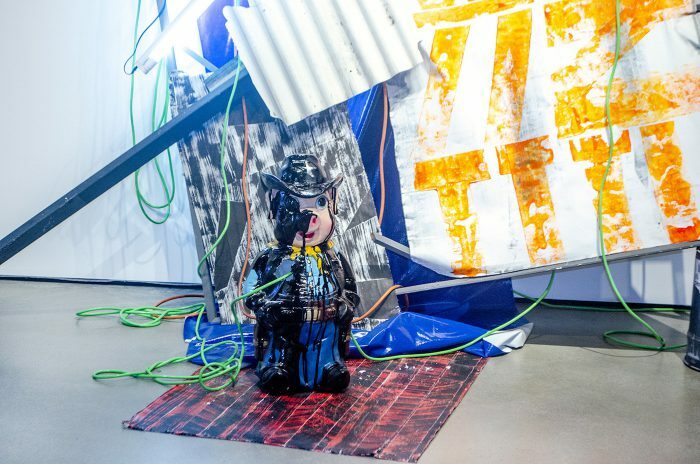 The compromised state of immigration policy in the U.S. is, unsurprisingly, a subject tackled by most of the artists in the biennial. 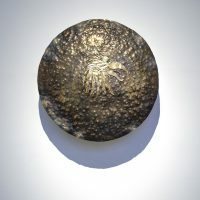 Artemisa Clarks’ subtle but effective gesture unites the colonial past and present through two small works that highlight the symbolic weight of gold, the source of much violence and destruction. 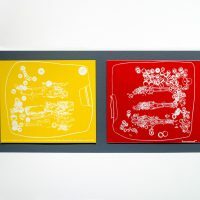 Using glitter vinyl and photorealistic ink on paper drawing, gold works to both conceal and protect the identities of undocumented workers who were victims of work-place immigration raids in the 1980s and 1990s. Her use of gold also works to draw attention to the problematic fetishization of indigenous peoples across time, a concern that many contemporary artists might also be careful to consider. While there wereseveral works in which the artists’ treatment of the indigenous past read as superficial (a problematic trend that contemporary artists should be alert to), Jane Chang Mi’s fantastic neon wall sculpture, Uterus (Útero), 2018, was not the case. 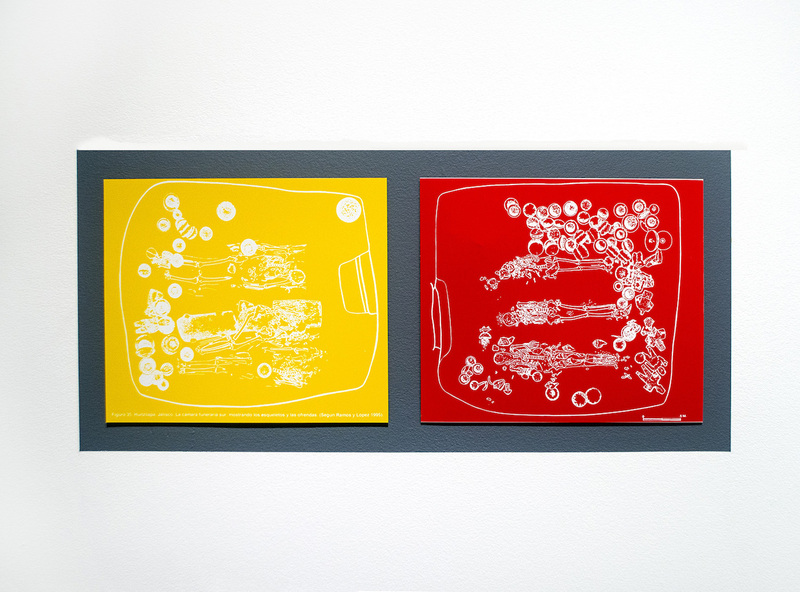 Her work references Chumash pictographs found in caves around the Santa Barbara region by rendering this image of female anatomy in the vernacular language of neon signs that have aesthetically helped to define the urban landscape. 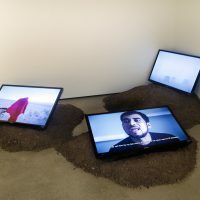 The organization of the show downplays the national or cultural identities of the artists (biographical data is refreshingly omitted from the wall labels), which calls attention to the slippery business of labeling artists by their place of birth, particularly in a state with a deep Colonial past. 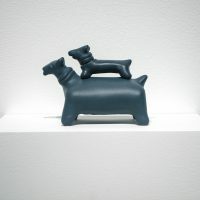 In some works, it seems that there was an intentional effort to let the works speak for themselves, or let the artists have the agency, to decide how much explanation or contextualization their works need. 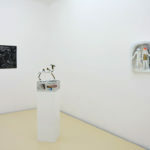 While a few projects might have benefitted from such didactics, it also allowed for the loose organization of the installation to evolve in to more of a dialogue between works and themes. 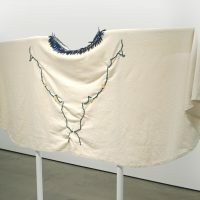 This small decision was a powerful one as it not only reinforces the “anti-biennial” roots of the initiative, it also evades the institutional compulsion to categorize, as it works to destabilize expectations and assumptions over what Mexican, Californian, or Border art “is “and who or what gets to define it. 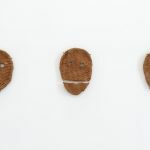 It will be interesting to see how future components of the MexiCali biennial address this, but in CALAFIA the curatorscan be applauded for their reluctance to neatly accept and celebrate concepts such as diversity and hybridity. They instead appropriately question how these concepts have been shaped by forces such as natural topography as well as constructed borders and boundaries that shift like dunes of sand. The biennial also reminds us of the enduring power of myths, imaginaries, and legends to transform cultures and societies. Can we imagine a different past for this colonized territory? What will the future of California look like when Calafia and her warriors rule the home of the resistance? La Bienal de MexiCali, presentando ahora su cuarta edición, es una iniciativa binacional curada por Ed Gomez, Luis G. Hernández, Daniela Lieja Quintanar, y April Lillard-Gómez que tiene lugar en sedes ubicadas a ambos lados de la frontera California-México durante el año. 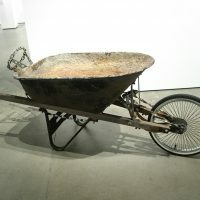 La bienal abrió a principio de este verano con una serie de performances de dos días en LACE, en Los Ángeles. La segunda iteración, CALAFIA: Manifestando el paraíso terrenal, lleva la bienal al campus de la California State University en San Bernardino con una exposición colectiva en el Robert and Frances Fullerton Museum of Art. 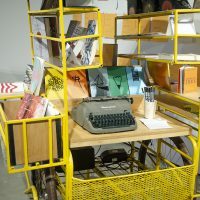 El formato ambulante y expansivo de la Bienal de MexiCali funciona para criticar y desestabilizar los centros, las periferias, y las fronteras definidas que han determinado la historia y cultura de la región. Presentando a 30 artistas trabajando en y alrededor de la región fronteriza, CALAFIA parte de una obra de ficción autoría del escritor español, Garci Rodríguez de Montalvo, de la cual se cree proviene el nombre del estado. Su novela, Las Sergas de Esplandián, impresa por primera vez en 1510, presenta a un personaje llamado Calafia, descrito como una reina negra guerrera quien preside una mítica isla llamada “California”, resplandeciente de oro y habitada por mujeres guerreras y criaturas fantásticas, como el grifo. Este territorio imaginario demuestra ser un concepto organizativo fructífero para la exhibición al presentar a California tanto como un paraíso, como un campo de batalla, y nos invita a imaginar cómo se vería California hoy en día si cuerpos no blancos, sus historias, y culturas no fueran continuamente desplazados, desconectados, y desaparecidos de las tierras que originalmente habitaban. 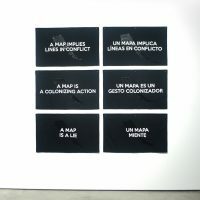 Calafia, una figura producida por la fantasía colonial, es revisada por los artistas en la bienal como una poderosa fuente de subversión y resistencia en contra de la imaginación colonial, pasada y futura. Muchas de las obras en la muestra —aunque no todas— abordan directamente el mito de Calafia y vuelven a ella como un símbolo de poder femenino. Un ejemplo es la entrega de Maya Mackrandilal de un busto de su figura en la escultura de técnica mixta ANTI- body 9 (Kalafia as Libertas). 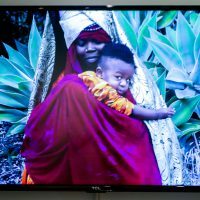 Este es también el caso de una de las piezas más atractivas de la exposición por lxs artistas de SNATCHPOWER, un “colectivo de artistas post-apocalíptico, afro-futurístico, liberacionista de mujeres”, como ellxs se describen. Channeling Calafia (Canalizando a Calafia), 2018, también premiada en LACE este verano, es una pieza acid-tinged, un video de rap futurista que presenta a lxs integrantes del colectivo asumiendo identidades de las reinas guerreras de California para imaginar un futuro donde las mujeres han reclamado los espacios —en este caso, el medio ambiente— que han sido robados, colonizados y cooptados a lo largo del tiempo. Una visualización casi distópica de las rutas míticas de California se encuentra más adelante en la muestra, en el video Califas (2018)de Victoria Delgadillo y Raul Baltazar, una alucinante película que aunque visualmente atractiva se pudo haber beneficiado de más explicación o contexto. En dichos ejemplos, Calafia es un símbolo de improbable utopía con poderes para restaurar y renovar pero también para dominar el paisaje natural. Otrxs artistas se refieren a Calafia por medios menos directos; no obstante, expresan esta visión curatorial. La Corrida – The Run (2012) de Xandra Ibarra, una video instalación presentada cerca del inicio de la exhibición muestra una figura femenina, presumiblemente la artista, corriendo a través de zonas fronterizas en el desierto de Chihuahua. El truco es que el video sólo se activa una vez que el espectador monta la caminadora anticuada que está instalada frente al video y comienza a correr. Aunque no es claro si la artista estaba pensando en Calafia y sus mujeres guerreras, uno puede imaginar fácilmente a la artista entre sus filas o incluso personificando el rol de la reina. Es notable que su obra requiere esfuerzo. Mientras avanzaba, intentando forzar la caminadora para que se moviera a regañadientes bajo mis pies, también fue imposible no considerar los millones de inmigrantes que han corrido por sus vidas a lo largo de este tramo de desierto. Aunque al principio estaba escéptica de este montaje, días después aún puedo recordar la sensación de recorrer el resto de la bienal con mi corazón latiendo fuerte y rápido. 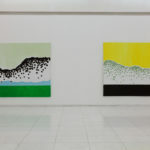 Otra fortaleza de la bienal, además de incluir un gran número de artistas mujeres, fue el deseo de lxs curadores de abordar percepciones externas e internas entre comunidades de color en California. Una pieza que trataba estas inquietudes de manera experta es el video de Chris Christion, The Unauthorized Historiography of California, Volume 1 (La historiografía no autorizada de California, volumen 1), 2018, que re-examina eventos históricos, como las revueltas de Los Ángeles en 1992, que han tanto dividido como unido a comunidades minoritarias. La instalación de Cognate Collective, California Mía, cercana a la pieza antes mencionada, hace referencia a las comunicaciones transfronterizas por medio de una instalación casi archivística de radios FM y materiales de archivo de su investigación sobre estaciones de radio “border blaster”. El estado comprometido de la política migratoria en los EE.UU. es, sin sorpresa alguna, un tema abordado por la mayoría de los artistas en la bienal. El gesto sutil pero efectivo de Artemisa Clark une el pasado colonial y el presente a través de dos pequeñas piezas que destacan el peso simbólico del oro, la fuente de mucha violencia y destrucción. Haciendo uso de vinilo brillante y tinta fotorrealista sobre papel para dibujo, el oro sirve para ocultar y proteger las identidades de lxs trabajadores indocumentadxs que fueron víctimas de redadas de inmigración en su lugar de trabajo en los ochentas y noventas. 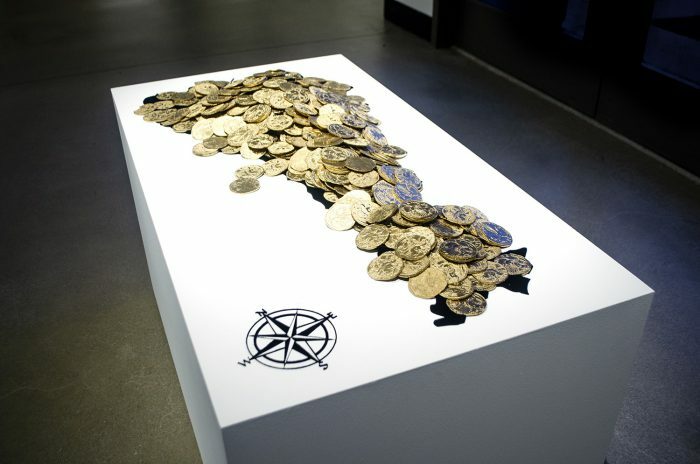 Su uso del oro también sirve para llamar la atención a la problemática fetichización de los pueblos indígenas a lo largo del tiempo, una preocupación que muchxs artistas contemporánexs podrían tener más en consideración. A la par que había varias obras en las que el tratamiento de lxs artistas sobre el pasado indígena era superficial (una tendencia problemática a la que deberían estar alertas lxs artistas contemporánexs), la fantástica escultura neón a muro de Jane Chang Mi, Uterus (Útero), 2018, no fue el caso. Su pieza hace referencia a los pictogramas de los Chumash encontrados en cuevas alrededor de la región de Santa Barbara, reinterpretando esta imagen de la anatomía femenina en la lengua vernácula de los signos neón que han ayudado a definir estéticamente el paisaje urbano. La organización de la muestra resta importancia a las identidades naturales o culturales de lxs artistas (la información biográfica es reconfortantemente omitida de las fichas a muro), lo cual lleva la atención a la resbaladiza empresa de etiquetar a lxs artistas por su lugar de nacimiento, particularmente en un estado con un profundo pasado colonial. 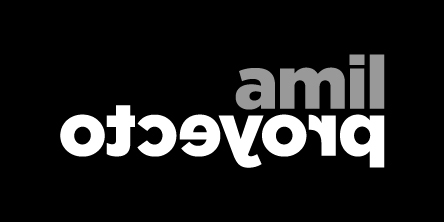 En algunas piezas, parece que hubiera un esfuerzo intencional por dejar que las palabras hablen por sí mismas, o por dejar que lxs artistas tengan agencia para decidir cuánta explicación o contextualización necesitan sus obras. Aunque unos cuantos proyectos se pudieron beneficiar de dicha didáctica, ésta también permitió que la holgada organización de la instalación evolucionara más hacia un diálogo entre obras y temas. Esta decisión aunque menor es poderosa, al no sólo reforzar las raíces “anti-bienal” de la iniciativa, sino también evadir la compulsión institucional de categorizar, trabajando para desestabilizar las expectativas y suposiciones sobre qué “es” el arte mexicano, californiano o fronterizo, y quién o qué lo define. Será interesante ver cómo los componentes futuros de la Bienal de MexiCali abordan esto, pero en CALAFIA lxs curadores pueden ser aplaudidxs por su reticencia a aceptar y celebrar ordenadamente conceptos como diversidad e hibridación. En su lugar, cuestionan apropiadamente cómo estos conceptos han sido formados por fuerzas como la topografía natural, así como las fronteras construidas y los límites que cambian como las dunas de arena. La bienal también nos recuerda del poder duradero de los mitos, imaginarios, y leyendas para trasformar culturas y sociedades. ¿Podemos imaginar un pasado diferente para este territorio colonizado? ¿Cómo se verá el futuro de California cuando Calafia y sus guerreras gobiernen la casa de la resistencia?